Hotel Prem Villas i Pushkar, Indien: Reservér nu! Location Hotel is situated near from New bus stand. It consist of 11 newly designed rooms with all modern amenities with attach Lath Bath. 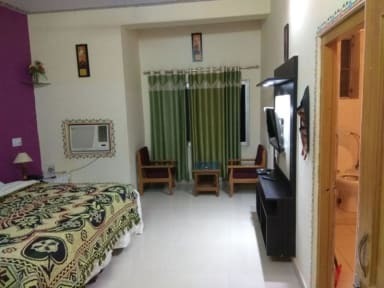 It has 2 Modern Designed Suit with attach lath Bath & Dinning Hall, we have our own spacious parking, rose and vegetable organic Garden & Restaurant. Sight seeing It is ideally situated on the eastern edge of Pushkar surrounded by mountains, forest, and a beautiful rose garden. This property offers visitors an un-forgettable experience of real unspoilt India at its rural. It's a naturalists dream come true with a crove of dense trees.